The continuing construction of the Manetti Shrem Museum of Art at UC Davis has reached a new phase, with the large metal canopy now finally coming together. 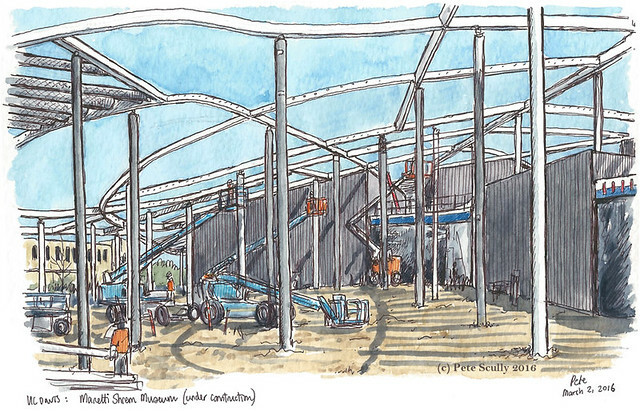 Early last month I sketched the scene above, the framework for the canopy undergoing its paint job, while the large metal slats that would make up the design were beginning to be inserted. It’s like a massive Airfix model but without the smell of superglue.This was particularly fun to sketch, figuring out the complicated lines and curves, but also because this scene is so brief – already it looks totally different. Here you see, just a few weeks later, the canopy is already complete, or as good as. 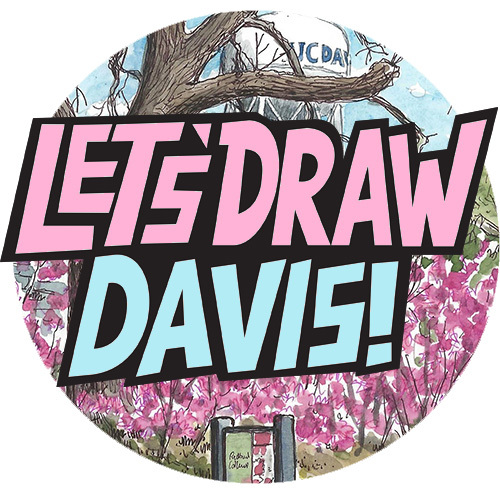 I sketched this on a day when the sky was lovely, with deep blues and fluffy white clouds, not a very common sky for Davis. Reminded me of Britain.I sketched this from beneath the shade of the UC Davis Welcome Center. The buildings around Vanderhoef Quad are modern and bright. This is a really exciting part of campus now. 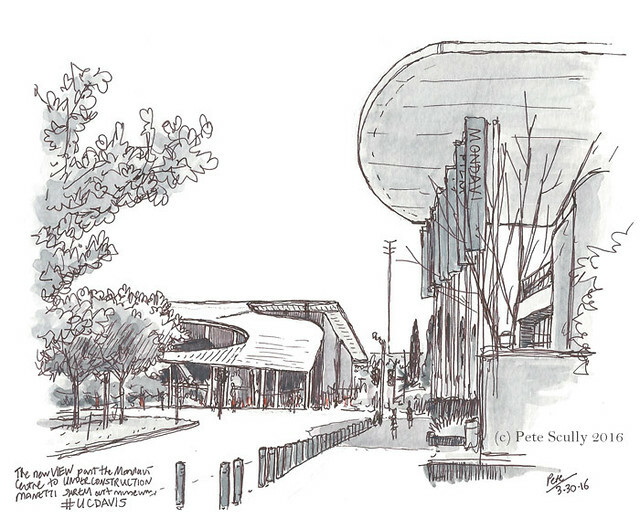 Below, I sketched another view of the Manetti Shrem from a little further back, beyond the Mondavi Center. You can see the interesting shape of the canopy as it curves around the entrance. This will be a really photogenic spot. I stood beneath a tree to sketch. As i did, I got several odd looks from people as they passed by. Nothing bad, just, I don’t know, frowns. Shifty looks, suspicious glances. I must look odd standing there with a sketchbook under a tree, it’s fair enough. People on this edge of campus are usually a bit better dressed. No, they are, I don’t know why. They are walking to their cars parked at the Mondavi or on their way to an important meeting at the Founders room at the Buehler or the Graduate School of Management or doing something in the Conference Center, I don’t know, they dress better than the people hanging out at the Quad or at the MU Bus Terminal. Maybe that is why they gave me shifty looks, “who is this odd freakish weirdo beneath a tree with a small creepy black book staring at the distance like a fool?” I put it down to turning 40. This didn’t happen so much when I was 39, no back then it was all, “who’s this cool character coolly hanging in the shade making fantastic cool urban art which is so cool?” But now I’m 40 it’s all changed, it’s all downhill from here. Or it would be, if Davis had any hills. 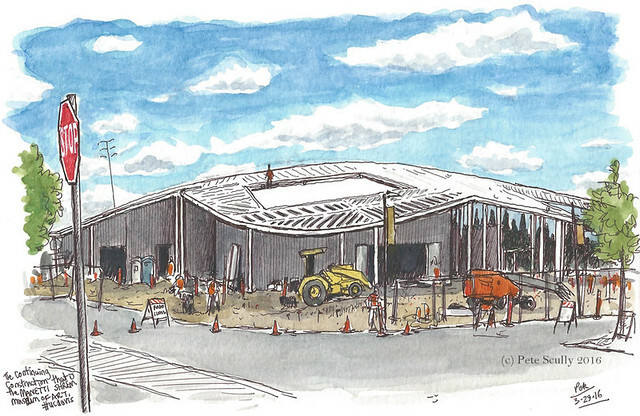 I’m enjoying sketching this construction though, and the Manetti Shrem will officially open its doors in the Fall with a Grand Opening on November 13, 2016. Check out their website at: http://manettishremmuseum.ucdavis.edu/.